Initially I was asked to write a book about inspirational stories of folks who used the material in Lynn Grabhorn's "Excuse Me, Your Life Is Waiting". I quickly found out that while these folks were having success, it was spotty at best. That's when I changed my intention for "Now" to be sure that readers walked away with tools and strategies as well as answers to questions that would help them move around their perceived obstacles to consistency. 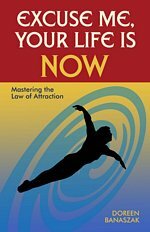 "NOW" will provide you with a reminder of the basics, take your knowledge to the next level and provide you inspiring real life examples of the powerful use of the Law of Attraction. 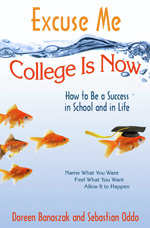 Using the Law of Attraction and Lynn Grabhorn’s Excuse Me, Your Life Is Waiting as a starting point, Excuse Me, College Is Now is an invaluable, up-beat guide for college students, and their parents, on how to navigate the stresses of college life to enjoy it. This e-book is all about the results you can get when you learn how to be in alignment with your dreams! I have compiled the most inspiring and informative articles from my newsletters and put them into an easy to access format so you can have ongoing support as you expand your experience with acceptance. There are over a 160 pages filled with real life examples, strategies and tips on expanding acceptance so that you can experience more freedom!It is my hope that this book will provide on-going inspiration at your finger tips!